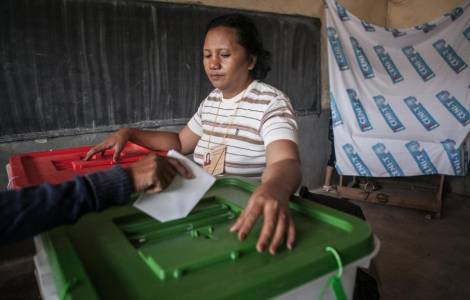 Antananarivo (Agenzia Fides) - Madagascar is waiting for the final results of the first round of the presidential elections held on 7 November. According to a first partial count, announced yesterday, by the Independent Electoral Commission (CENI), concerning 1350 of the approximately 25,000 seats, Andry is ahead with 42.86% of the votes, followed by Marc Ravalomanana (40.18%) and Hery Rajaonarimampianina (4.38%). The latter denounced "numerous irregularities and anomalies" that apparently occurred during the vote, citing in particular "an invalid electoral list", "the presence of electoral ballots already filled out" and "intimidation". The accusations of the outgoing President have however been denied by the European Union election observers, who in a statement say they only found "marginal irregularities" that "did not had any influence on the result of the elections". The three main candidates have all held the office of President. Marc Ravalomanana, from 2002 to 2009; Andry Rajoelina from 2009 to 2014; Hery Rajaonarimampianina from 2014 to 2018. The electoral campaign of the three former Presidents was characterized by the use of large investments in money and resources to prevail over the 36 candidates who are competing for the supreme office of the Country. "The Catholic Church has no candidate for the presidential elections", said His Exc. Mgr. Victor Solo Rakotondrajao, Bishop of Mahajanga, on October 14, on the occasion of the closing ceremony of the World Youth Days in Madagascar. Some of the candidates for the November 7 elections attended the ceremony. The Bishops denounced the politicians' attempt to exploit the event promoted by the Catholic Church for electoral purposes, given that the World Youth Days in Madagascar were held from 8 to 14 October, right at the beginning of the election campaign.